Read Takshshila.net news digest here: view the latest Takshshila articles and content updates right away or get to their most visited pages. Takshshila.net is currently listed among low-traffic websites. It seems that Takshshila content is notably popular in India. We haven’t detected security issues or inappropriate content on Takshshila.net and thus you can safely use it. Takshshila.net is hosted with GoDaddy.com, LLC (United States) and its basic language is English. 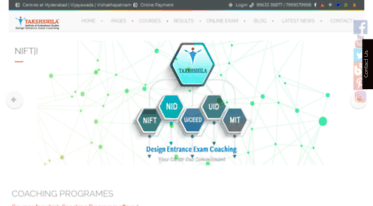 Takshshila provides entrance exam coaching for UCEED-2016 as per latest UCEED syllabus and paper trend. Takshshila Hyderabad announces all updates on different platform like blog,pinintrest,facebook .Every aspirant should follow our NIFT-NID-CEED-UCEED-NEWS. India’s Best Design & Architecture Entrance Exam Coaching Institute is now providing Coaching at Vijayawada, Benz Circle.